Negotiating the stormy seas of the retail world requires more than just a capable captain – a sturdy anchor is also invaluable. 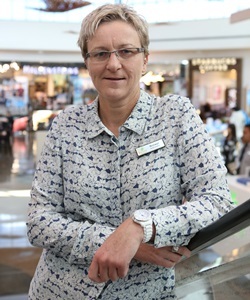 Fortunately, Auckland’s Botany Town Centre (the biggest combination indoor/outdoor mall in the country) benefits from both, thanks to the efforts of its general manager, Bronwyn Anchor. – Considering the south east of Auckland has four major malls and various smaller centres, has Botany Town Centre found a niche which is supported by locals? If so, what has been the secret to the centre’s success? The town centre format of Botany accommodates a range of community activities and we enjoy strong community links and involvement. We see the centre as a hub for the local community to come together and spend quality time with family and friends. We host a number of community events and activities throughout the year. Our research tells us that, for a regional centre, Botany has a strong retail offering, with 25 percent more floor space than a typical regional centre, accommodating a comprehensive fashion offer with a high proportion of prominent national retailers. – Are you mostly confined to your office or is their time to move around the mall meeting/greeting retailers and other tenants? That’s the beauty of my job: how many people get paid to spend time in a shopping centre? It’s great to not be desk-bound and I walk the centre every day to enjoy the buzz and the social aspects of being part of the Botany Town Centre community. – How stressful is your job and have you ever thought of throwing in the towel and taking on a less pressured or time-consuming role? I am fortunate to have one of the most experienced, supportive and passionate centre management teams in the country, and this certainly keeps the stress levels manageable. Our customers and retailers also take much pride in Botany Town Centre, and their ‘ownership’ of the centre is a great support. It’s certainly a challenge to drive away from the beautiful beach I live near each morning, but to date I’ve kept turning up for work! – Do you have time to enjoy centre events? How important are they to the centre? Events are at the core of what we do to complement our retail and hospitality offers, and they’re the best way to connect with the community and bring Botany Town Centre alive as a community hub. We really try to create events that are family-focused and suited to a growing and diverse community, and I particularly love the lifestyle-centric events such as the Summer Fun Run. The launch of the Botany Community Garden earlier this year was a highlight for the whole team, and our recent Botany Design Awards were again a big success. Everyday Heroes Day celebrates the people who keep us safe in the community and is always a special day. Every event has a place in my heart! – The centre has undergone considerable changes and upgrades in its retail layout over the last 2-3 years. What developments would you like to see in future and are there fresh plans in the pipeline? As with most shopping centres, development is key to remaining relevant and competitive. We have a development master plan that has our continual focus. We are currently working on a couple of exciting development and while the centre has always offered great eating options, we are also working on adding another restaurant to the mix – watch this space! – Would you welcome better transport links and would you encourage a rail connection between the centre and the new Manukau station or even to the central city? Botany Town Centre is a key transport hub, particularly for buses, as it covers services to a wide range of regions. Bus services have increased from 233 on a typical day in 2007 to 456 today, and this continues to increase. We would welcome rail to our doorstep, however this is outside of the scope of the Auckland-Manukau Eastern Transport Initiative. – Is online shopping a threat to the future of the mall? We believe shopping in store is still a significant leisure activity for many New Zealanders and shopping centres are still where people go to meet their friends, shop and enjoy the environment. – H&M recently announced that its first NZ store will be at nearby Sylvia Park. How important is it for the town centre to attract such major overseas stores to our area? We are very aspirational at Botany Town Centre, and the site, which covers 17 hectares, has plenty of potential. We are always seeking to improve the retail mix at Botany Town Centre and we have a master plan in place to accommodate international high street fashion brands. – If you could be mayor of Auckland for a day, what would be your first priority and why? I would work closely with the Government on improving/increasing social housing and housing affordability. I think the current mayor’s [Len Brown] focus on public transport improvements is to be applauded. – If you could ask any three people (living or dead) to dinner, who would you invite and why? Ellen DeGeneres: because she is quirky, funny and inspiring, and a great role model for just being herself – Graham Norton for the same reasons, if Ellen was busy. John Key: because there’re a few things I’d like him to do; I have a list! Kate Sheppard, leader of New Zealand’s women’s suffrage: for her help with women gaining the right to vote in New Zealand. I am proud that we were the first country in the world to giving voting rights to women. And, just to be cheeky, I nominate a fourth: Jean Batten, our greatest aviator.